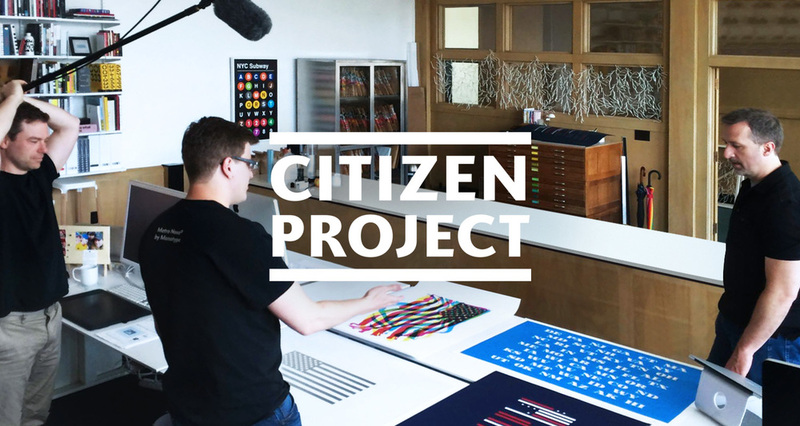 The Citizen Project is a collaborative of four creatives in Grand Rapids, Michigan—designers Jody Williams, Brian Edlefson and type designer Terrance Weinzierl, and illustrator and designer Michael Nÿkamp. Formed by Williams, the collective was established with the intent of collaborating on side projects with a purpose: to raise awareness of the amazing talent in Grand Rapids. “As independent creatives, corporate projects tend to keep us isolated. We wanted to find ways to collaborate with our friends and peers. The Citizens Project lets us choose a common cause and theme, then produce our own visual interpretation of it. We hope to collaborate on at least one new project every year and bring other artists with other skills and interests to our effort.” —Jody Williams, Designer. “We would meet up once or twice a month to discuss concepts and how to fund the project,” Michael Nÿkamp recalls. They devised this year’s theme commemorating the 200-year anniversary of Francis Scott Key’s writing of the Star Spangled Banner. Each artist will designeda limited-edition poster that will be silkscreen-printed by Continental ID. “We all created an inspired poster featuring our interpretation of the American Flag,” Nÿkamp added. Color Wave by Jody Williasm. Printed on Smart White from French Paper Company. Thirteen Stripes, Fifty Stars by Michael Nÿkamp. Printed on Neenah’s Classic Crest® Cover Avon Patriot Blue. Citizen Project used Kickstarter to help fund paper and printing costs, with print runs limited to 250 of each poster. Donors receive a set of four signed and numbered posters. Chuck Oleniczak at Central Michigan Paper helped the artist choose a sheet that would work best for each design. Nÿkamp’s poster is printed on Neenah’s Classic Crest® Cover Avon Patriot Blue. Brilliant choice! “Thirteen Stripes, Fifty Stars, was created by deconstructing the flag elements and rebuilding its form while maintaining the flag’s inherent characteristics. Some people see a building in a night sky, some see Morse code, and others see a waterfall, but I leave the interpretation of my piece to the viewer – to create their own meaning and make it their own.” —Michael Nÿkamp, Designer. Canton by Terrance Weinzierl. Printed on Smart White from French Paper Company. Weinzierl, of course, employed typography for his poster design, while the others used more literal forms of the flag in their interpretations with varying results. Three of the four posters were shown in a Star Spangled Banner 200th anniversary exhibit in Baltimore, Md., with Nÿkamp’s design receiving an Award of Excellence. American Portrait by Brian Edlefson's , printed on Brilliance, Super Reflector Film from Decorated Paper. Please note: the American Flag is a reflective – this image shows a resemblance of what a user would see when looking in. The Citizen Project hopes to broaden its pool of collaborators. The core group of four wants to draw in artists with different talents to collaborate on future projects. “The side effect of this process has been that we created new personal and working relationships with each other and had an amazingly fun time doing so,” says Nÿkamp. Collaboration. Freedom. Purpose. New friendships. That is a what we’d call a Star Spangled success. Note: You can find additional information about this project on: Facebook, Rapid Growth and purchase them on mmm good art. Note: This article was originally published on Neenah Paper's blog, Against The Grain in December of 2014. This article was written by Emily Potts has been an editor and writer working in the graphic design publishing trade for more than 20 years. In that time she’s managed a slew of publications, people, and events. Since July 2014, she has been an independent writer, editor, and consultant working for a diverse range of clients including Neenah Paper, Creative Live, AIGA, Goodtype, Elements, and more. Emily loves interviewing people and telling their stories.